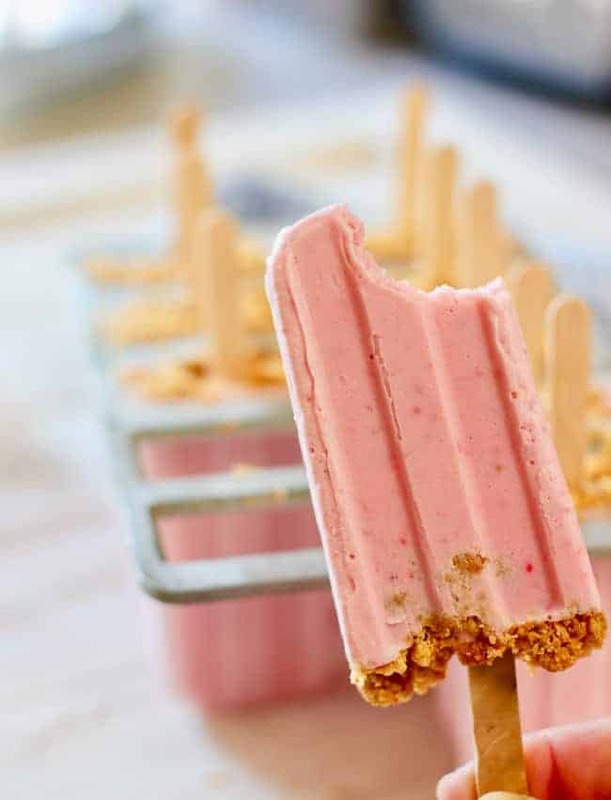 These super easy to make Strawberry Cheesecake Popsicles are creamy and delicious ! With a handful of ingredients you can whip up a batch in no time! Fresh strawberries, cream cheese, milk and a bit of yogurt all whirled up in a blender! I used my Nutri Bullet Blender. Because it’s one of the few gadgets I own. I don’t even have a regular blender or food processor …say what? But if you have a blender or food processor, and apparently more cupboard space than me, either of those gadgets would work great! 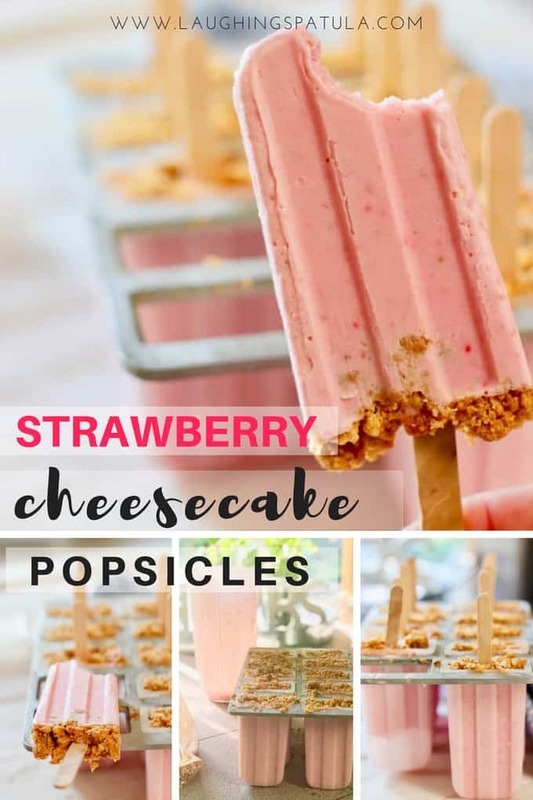 These popsicles are really strawberry cream cheese milkshakes masquerading as popsicles! 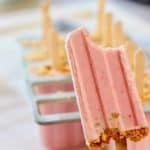 Something else I found that I love are these pumpkin cheesecake breakfast popsicles- omg, yum! And get this..ONE HUNDRED AND SIX calories each! I repeat ONE OH SIX! I’ll take two! We like this popsicle maker . It makes 10 of these delicious treats. Fill a large deep baking pan with hot water and set the entire mold in the pan, making sure it doesnt reach the top. About 3/4 up should work fine. Let them sit there for 3-4 minutes and they should slip right out! I remove all of them at once and place in a ziplock bag flat (do not stack or they will freeze together). That way I have sweet creamy treat when ever I want! To sweet treats that don’t break the calorie bank! 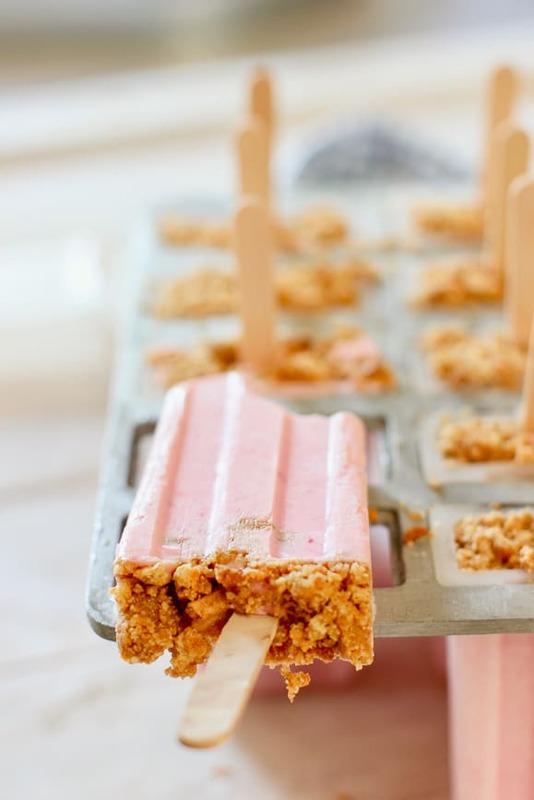 These creamy, easy to make and totally delicious popsicles will become a summer staple! Crush graham crackers and mix with 2 tablespoons butter and 1 tablespoon sugar. Set aside. 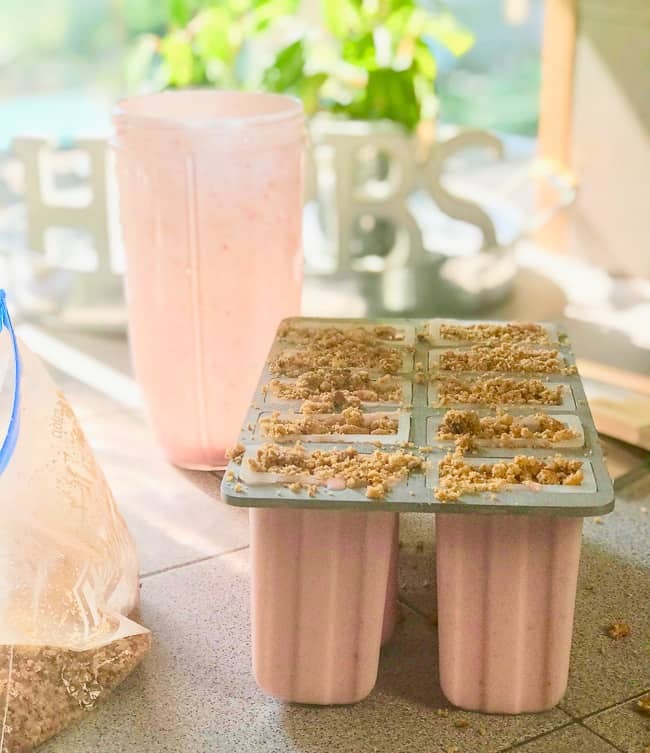 Using a blender or food processor. Blend strawberries, cream cheese, sugar, milk and greek yogurt until smooth. 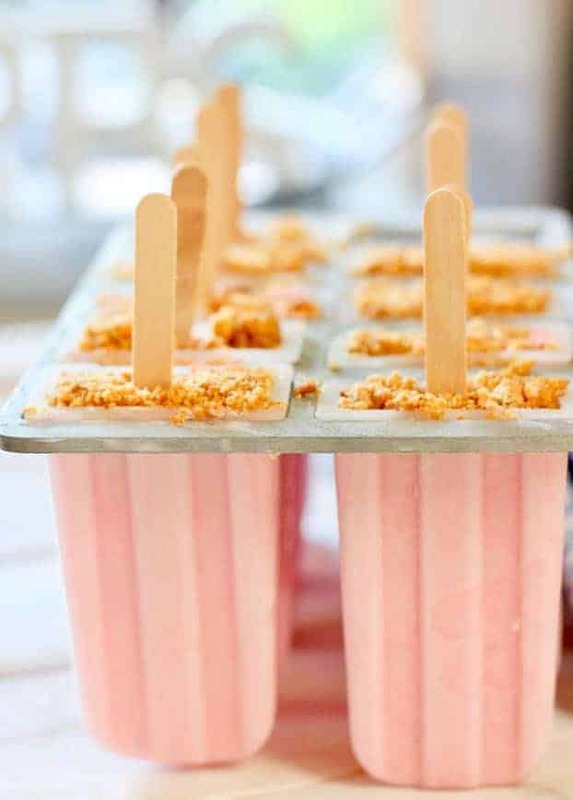 Pour into popsicle molds about 3/4 way full. Top with graham cracker crumbs. Insert sticks and freeze at least 6 hours or best over night. To remove pops from mold, I find the best way is to dunk the entire mold (up to the top) in a hot water bath for 4-5 minutes. Remove popsicles and store in air tight container. Much easier than trying to remove one at a time! Ya, I’m a little late with a frozen desert recipe but these are soooo good, I didn’t want to wait until next summer to post them! p.s. 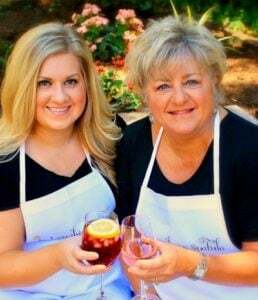 Rachels husband Greg took the picture in their beautiful backyard! Apparently I can only do food photos LOL! Thank you Angelina for the nice compliment ;). Can you make a pie with this recipe?